Glide effortlessly through the largest urban cultural park in the country! Yes, bigger than Central Park! Your tour will cover 1,200 acres of a magnificently manicured landscape that will amaze you. Your expert local tour guide will educate and entertain while providing fun facts about the history and culture of San Diego's Balboa Park. Balboa Park is the home to 15 museums, performance venues, Organ Pavilion, Balboa Park Carousel, Cabrillo Bridge, Balboa Fountain, 13 prestine gardens and of course the world famous San Diego Zoo! Make sure you come with a sense of adventure because your guide will be leading you on unique trails that are off the beaten path giving you a truly one of a kind San Diego experience that you can only get here! 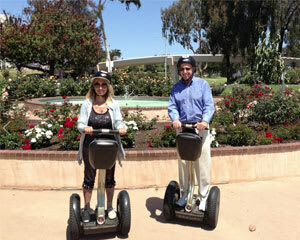 Balboa Park is huge, and seeing it on a Segway is cool.